Hmmm Lagagna… what a treat. 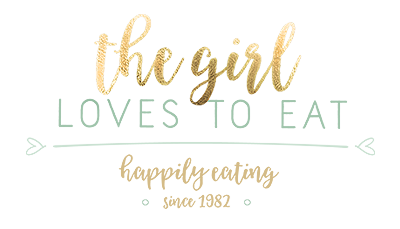 I tried out a lot of different variations over the years, but I always come back to the classic recipe. Well, not completely classic in this case, but pretty damn close. It still has the soft pasta, the rich tomato sauce and the creamy béchamel on top. But I added some aubergines. 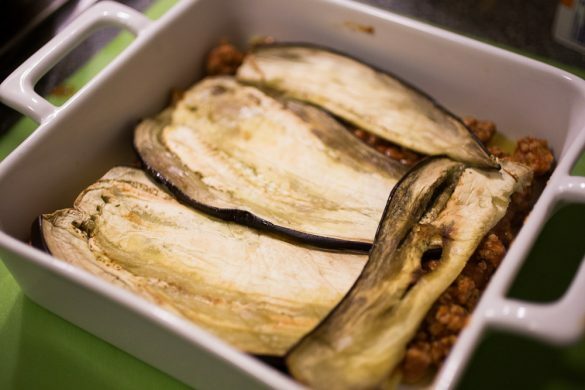 Aubergines are perfect for lasagnas or other kinds of casserole. You could substitute the pasta completely with aubergines if you like. Or you could add some cooked potatoes and make a moussaka out of it. So many options. I didn’t add the aubergine to give this recipe an illusion of being healthy. Not a bit. Not in the slightest. Not at all. This is anything but a healthy dish, that’s alright, because it’s so damn delicious. And it’s not really something you whip up after work on weekdays. 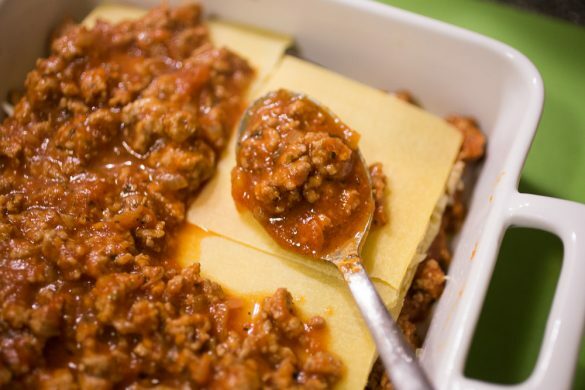 A nice lasagna is rather a dish you make on the weekend and I sure like to go a bit overboard foodwise on weekends. 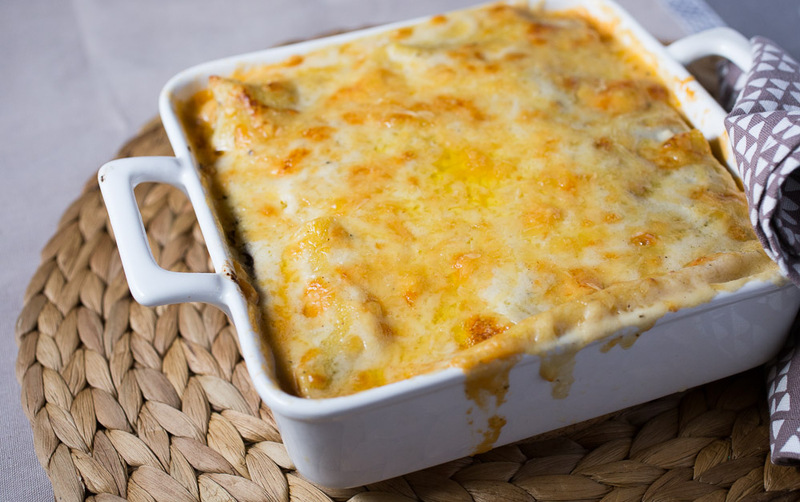 Lately I noticed that a lot of classic lasagna recipes online don’t have the béchamel sauce in it. 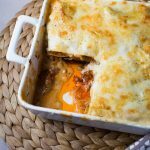 That’s quite surprising, because béchamel is one of the basic sauces of french and italian cuisine and for me it belongs on top of every classic italian lasagna. It’s time people show the béchamel some love again. It’s a phantastic sauce, with so much potential for variations. 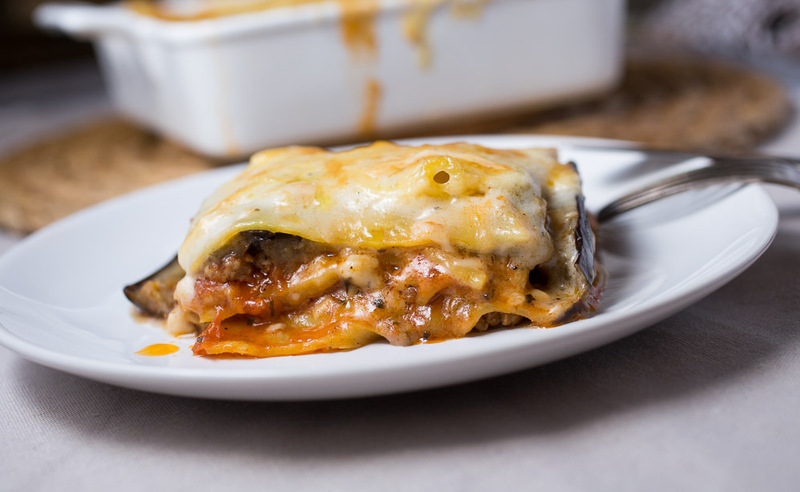 Classic lasagna with a twist. Turn on the broiler in your oven and line a baking sheet with aluminum foil. 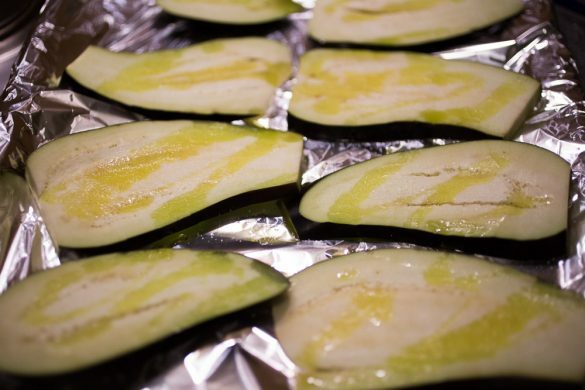 Cut the aubergine lengthways in 1cm thick slices and place on the sheet. Salt lightly and sprinkle with some olive oil. Place under the broiler. Each side will need about 10-15 min depending on your oven. Just check once in a while. The slices are done when they are starting to brown and are nice and soft. In a large pot or pan heat one tablespoon of olive oil, add the onion and sauté for a minute. 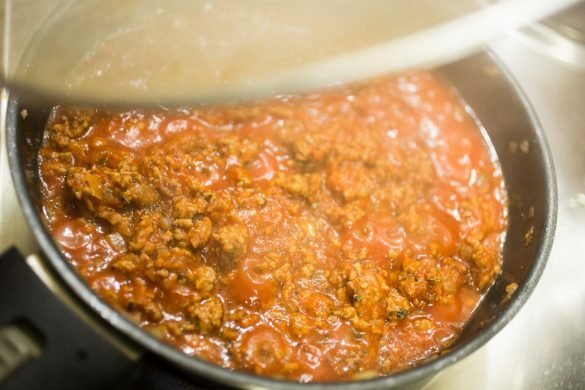 Add the ground beef and fry until the meat starts to brown. Add the tomatoes, basil, oregano, salt and pepper and turn the heat down. Let the sauce simmer for 20min. 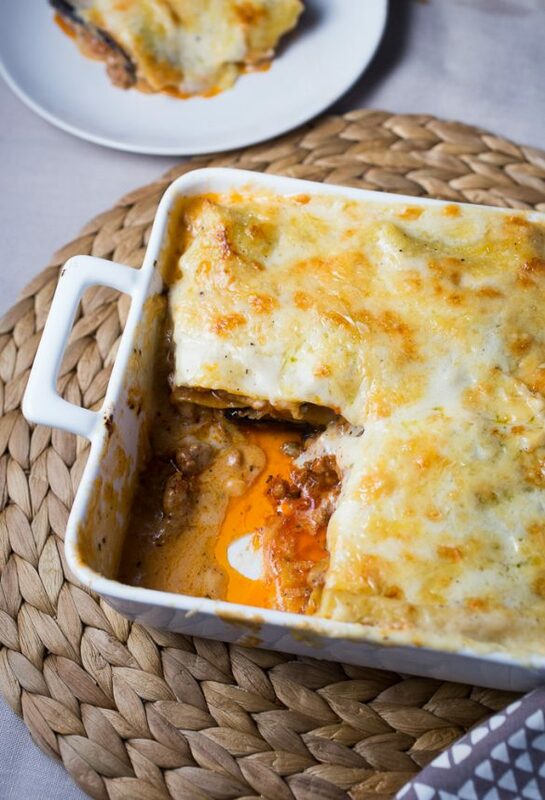 Don't let it get too dry or else your lasagne will come out of the oven with hardly any sauce left. While the tomato sauce is simmering you can prepare the bechamel sauce. 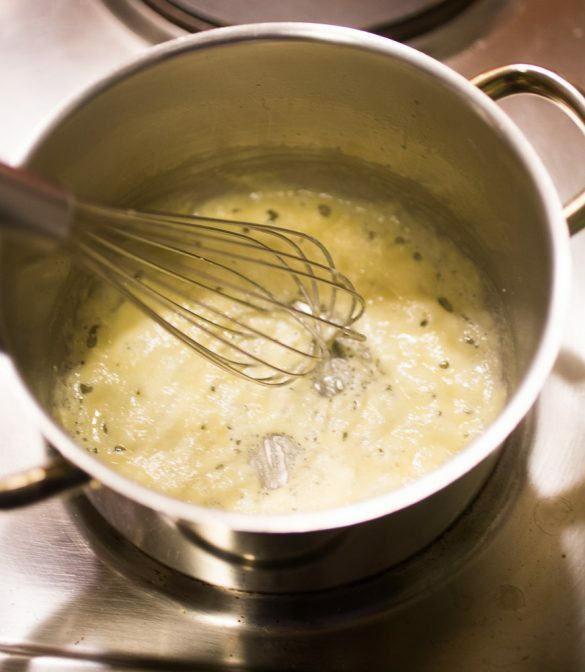 The base for every bechamel is a roux. In a sauce pan heat the butter on medium heat until it's slightly bubbling. Add the flour and start whisking. When the mixture gets light brown add the milk one bit at a time. The liquid will thicken really quick so keep on whisking adding more and more milk gradually until the sauce coats the back of a spoon. Add salt and pepper to taste and a pinch of nutmeg. When all the components are ready you can start to build the lasagna. But first turn off the broiler and set your oven to 180°C / 350° F. I used a 20x20cm (8x8inch) casserole dish for this recipe, but anything close to that will work. Spread a little bit of tomatoe sauce into the dish first. 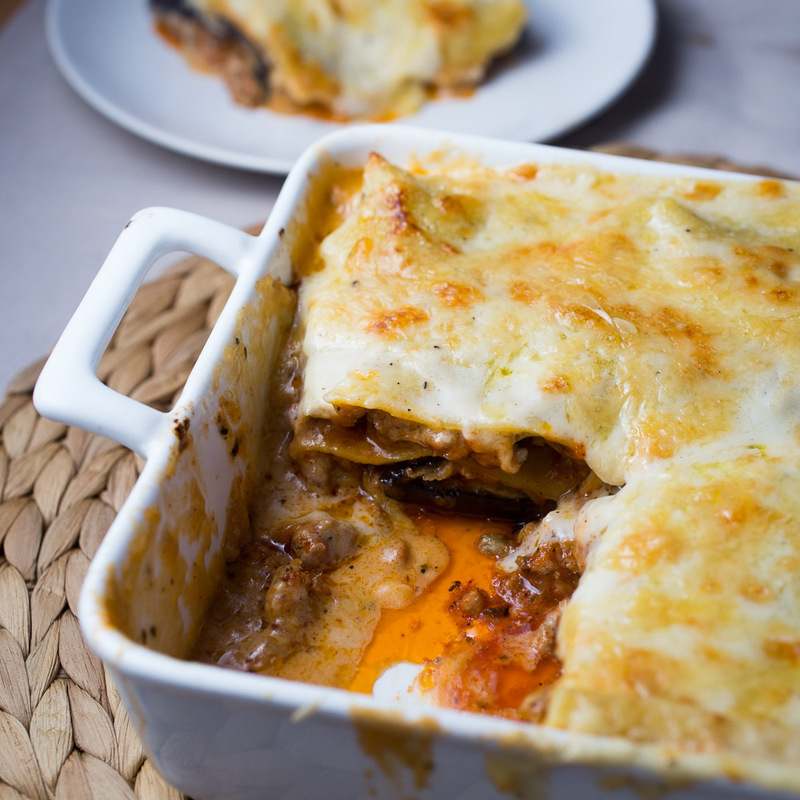 Then start building: Lasagna sheets - tomato sauce - a handful gruyere - aubergine - lasagna sheets - tomato sauce - aubergine - lasagna sheets - tomato sauce. 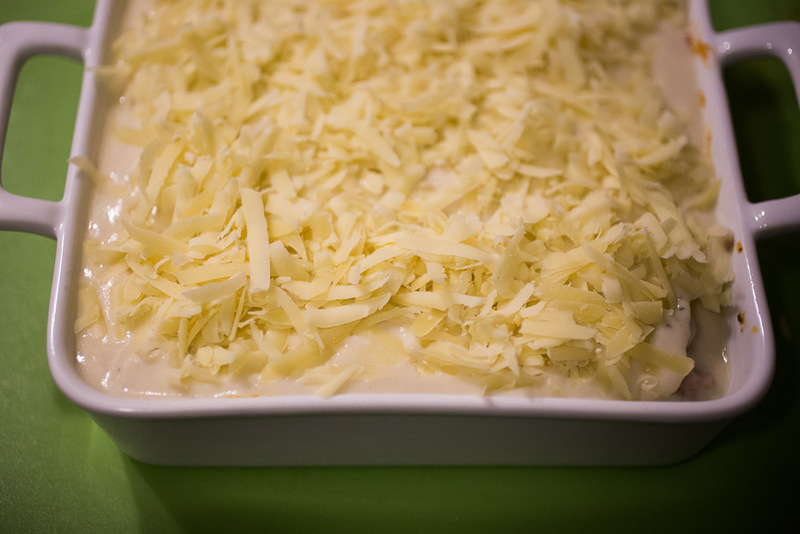 To finish it pour the bechamel over everything and top with the leftover gruyere cheese. Bake for 20-30min or until the cheese is golden brown.